The desert is alive with spring color. The Palo Verde trees are blossoming out into masses of brilliant yellow, and spiky, red flowers have sprouted on the tips of the ocotilla. Plus, the first pink and red cactus flowers have appeared. I'm told you can make jam out of the fruit. I must get the recipe. You don't usually think of a desert as being beautiful, but the Sonoran Desert is. It's also the only place in the world where saguaro cacti grow. They're the ones with the arms, that you see in all those old Westerns. I keep trying to see it all through Bao's eyes. Or -- probably more accurately -- to smell it through his nose. Just as our world is shaped by images, his world is shaped by smell. Perhaps that's why he seems to dislike windy days. Too many smells, all mixed and muddled together, assailing his nostrils. Bao doesn't like muddle. We've had some strong winds, these past few days. I'm always careful about walking under the gum trees (or eucalypts, as you call them here) on windy days, because a branch can break off in an instant, without warning. Widow-makers, Australians call the gums. Yesterday, when Bao stopped to lift a leg, a gust of wind caught him (the little, upraised leg was like a sail) and blew him over. I just wish you could have seen the look on his face! He was bewildered, embarrassed and miffed, all at once. Can't blame him, really. Had to pick him up and give him a kiss and a cuddle. He's much happier out on our sunny, sheltered patio, watching the finches and doves on the bird-feeder, and smelling the roses. 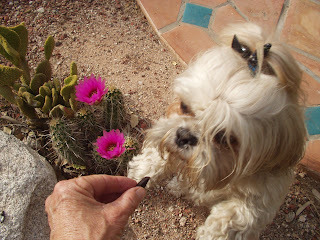 Or in this case, being bribed to be photographed alongside the cacti. How funny. I'll bet Bao was surprised. My daughter had a dog that was a scent hound and she loved the wind. She'd hold her nose high in the air and have a regular old sniff-o-rama.